The Bunk Bed tree house is enticing, the store position is clear as a Please Do Not Climb Warning. The roll down fabric sign also automatically restricts access in a very polite manner. And it gives an explanation of why such a kill-joy approach … “For Your Safety.” You could soften further as “For Your Child’s Safety” to pluck at parental heart strings. 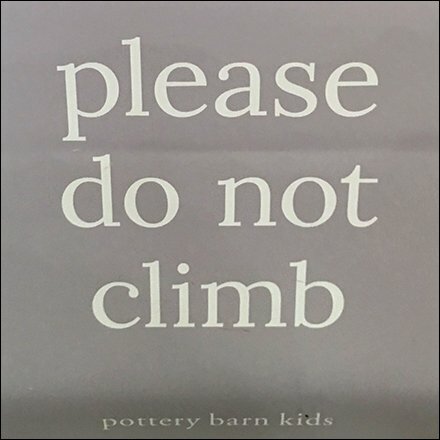 This Bunk Bed Please Do Not Climb Warning effective sign and barrier technique seen in Pottery Barn Kids, The Short Hills Mall, Chatham NJ.